With the public release of Google’s Chromecast SDK, an onslaught of app updates to support casting was inevitable. Take photo slideshow app Dayframe, for example, which integrated cast functionality today. While slideshow apps may be a dime a dozen, a slew of nifty features puts Dayframe a cut above the rest. Dayframe’s interface is sleek and modern, conforming to HOLO design guidelines. Navigation is made simple by the relegation of configuration options to two hamburger menus: one on the left for settings, and one on the right for saved “favorite” slideshows. As you’d expect, the app is capable of displaying images in a slideshow from your local library, but it can also pull pictures from Instagram, Dropbox, Facebook, Google+, Flickr, Twitter, and 500px albums. Don’t take many photos? Dayframe’s discovery feature culls slideshows from other users based on categories like “Animated Gifs”, “Geek Culture”, and “Foodie Food”. An especially neat feature of Dayframe is timers. With timers, you can program the app to begin specified slideshows at a particular time and day. If you often set your phone or tablet on a dock, it’s the perfect way to put your charging device to good use. The Chromecast functionality, which requires an in-app purchase, is apparently straightforward: you can Cast slideshows from your device to your television, and navigate through them using swipe gestures. I wasn’t able to test the feature, though, because I couldn’t get the in-app checkout menu to pop up. That may be a Play Store issue, but it was definitely irritating, and hopefully something the developer rectifies soon. Dayframe is available for download from the Play Store. 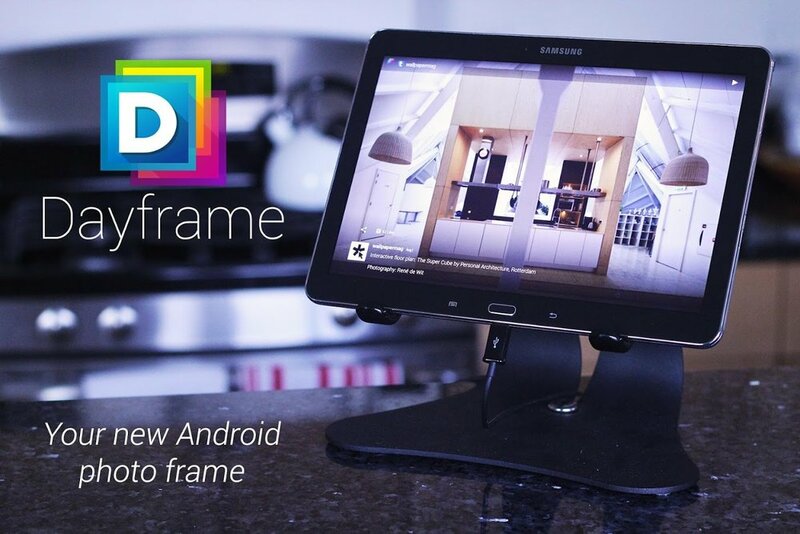 The premium version, Dayframe Prime, is a $2.99 in-app purchase. Note: The developer would like us to mention that those who’ve purchased Dayframe Prime as a separate app in the past are eligible for an in-app upgrade. If you’re one of those folks, just shoot an e-mail to hi@cloud.tv. UPDATE: The developer reached out to let us know that they already had to pull Chromecast support. Something about the official SDK not being released yet. They expect support to be back in the near future.